This week after over 6 weeks (or 45 days exactly) I got back on my bike. I don’t know why I haven’t been riding recently, think it was a combination of the bike getting repaired (which the bike shop botched, my wheel is still making noises) and the weather but no real excuses. 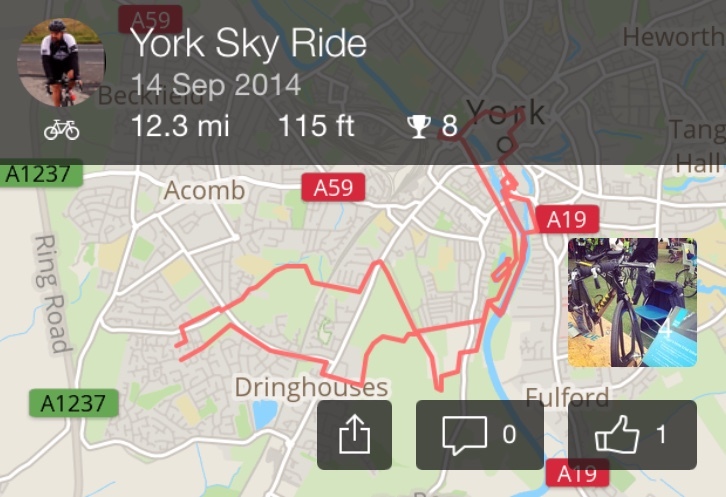 It was a fun afternoon cycling round York with the girlfriend, checking out various cycling related stands and events. One thing that it did show me though is that cyclists can be complete idiots. Riders were just cycling everywhere, stopping in the middle of cycle paths without checking if anyone was behind them and even arguing with the Sky Ride stewards. I kinda put me off the sport a bit, I was a bit embarrassed to be associated with them all. Anyway, had a few days off work so I thought I’d get the road bike out and see if the LBS had fixed it properly. They had not. My front wheel was still making a catching noise – I thought they had replaced the bearings, obviously not. I hate complaining and haven’t taken it back yet but I suppose I should do tomorrow. It will be nearly 7 weeks since they did the work so they will probably tell me to do one. What an effort it took to get round. I thought about turning round a few times as I pushed on in the cold. 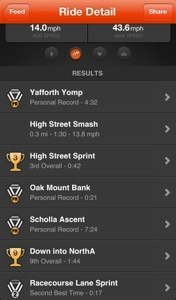 My average speed was below 15mph which is slow for me, I could really tell that I have been off the bike for some time. Moral to this story, 6 weeks is too long to not ride, you suffer. I was quite ‘bike fit’ for a fat man before stopping riding and had just done my first imperial ton so I presumed I would carry my fitness for longer than I did. I did go out for a quicker, shorter ride a few days later and averaged 15.7mph so even just a couple of rides later it’s coming back to me, slowly. If anything it has given me some motivation to keep riding and to keep fit. Another ride is planned for tomorrow and hopefully I can get over 250km in this month if the weather stays mild. Fingers crossed! 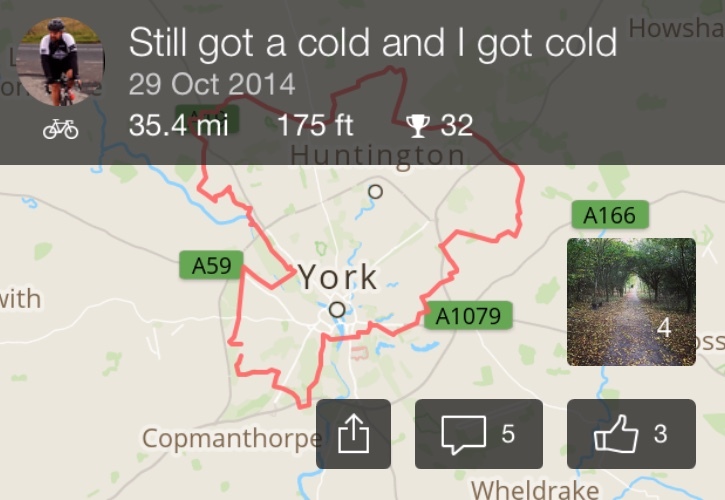 Well after Tuesday’s Strava disappointment last nights ride was probably my best effort so far segment wise. Managed to get 9th on a downhill segment averaging 31.6mph with a top speed of 43.6mph and 3rd on a sprint out of 218 riders! A few personal bests thrown in for good measure just topped it off! Annoyed with the weather though. As I type it’s throwing it down preventing me going out again. I need a decent rain jacket. The delightful Met Office have been telling me all week that it was going to rain tonight. Thunder, lightning, the works. With this knowledge I worked late, went to the supermarket and had an early tea thinking “no point going out on the bike, it’s gonna piss down soon”. Well it didn’t. It’s been decent conditions for biking. Not too hot, not too cold, just right. Anyway, just before bed I check Strava and discover that someone I follow has gone out and knocked me out of the top 3 of a segment. The very segment I was going to ride tonight. Charming. So cheers weather. I’m going to ignore the Met Office, and BBC weather for that matter. If its fine tomorrow night I’m going for a ride, even if I get soaked half way round! !